Living with Confidence In A Chaotic World by Dr. David Jeremiah is a practical book. It's inspiring because it leads us to think everyday about what God would want us to do during these last days before his Second Return to glorify us. After reading this book, it's impossible for me to say I don't know what the Lord expects of me during these last days. Dr. Jeremiah discusses the need for compassion toward one another as we move through a rush, rush world. world. One scripture in the book is how can we love God, if we don't love our brother. All of the scriptures are specific to the point Dr. Jeremiah is making in his book. I wanted to put my memory to work by memorizing some of the scriptures given in "Living With Confidence In A Chaotic World." Reading the Bible along with gathering with one another in church will make us able to wait for Christ's return with Peace in our hearts. 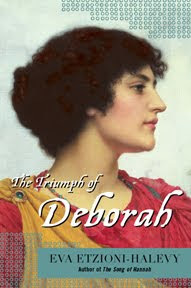 "The Triumph of Deborah" by Eva Etzioni-Halevy is a Biblical novel about Deborah, the Judge and Prophetess of Israel. With great precision and creativity Eva Etizioni-Halevy draws a historical picture of the history of conflict between Israel and Canaan. It is a time of turmoil. Those in power one day are not in control the next day. Those in slavery became free according to who conquered and who became conquerors. It is a time when women had a huge role to play in history. For instance, Deborah, the Israelite, who prophecies and commands the strategies of the Israelites war against the Canaanites. There is Jael, another woman, who will murder a Caananite leader, King Sisra, for the sake of her people.